44 Iraqi MPs Resign: Who Are They, and What Are the Consequences? Following the recent political crisis in Iraq involving the arrest of a prominent Sunni MP from Anbar, 44 Iraqi MPs resigned yesterday in protest. Media seemed content to dwell on their numbers and their Sunni sectarian identity, but questions remain regarding their backgrounds, political affiliations and not least the consequences of their resignations. Regarding the identities of the resigned MPs, the question can be resolved quite easily. Some media claimed that they all belonged to the bloc of parliament speaker Usama al-Nujayfi, but that couldn’t be true since Nujayfi does not control that kind of number of deputies on his own. Thankfully, though, a website affiliated with his bloc has released the names of the resigned MPs. This makes it possible to collate their names with their political sub-entities within the secular-Sunni Iraqiyya coalition in the Iraqi parliament, as well as the governorates they represent. It should be stressed that the list of resigned MPs is probably based on a statement of Zafir al-Ani as it was delivered, because it contains some obvious misspellings of names and makes it quite impossible to verify the identity of a handful of resigned deputies. Nonetheless, the patterns that do emerge are clear enough. In the list above, the category “other” includes a Turkmen representative as well as the reported shock resignation of Hajim al-Hasani, who was given his “compensation” seat in parliament as the Sunni face of the State of Law bloc of Prime Minister Nuri al-Maliki. Those listed as “Allawi” tend to state their affiliation as being with the Harakat al-Iraqiyya created in 2009 rather than the older Wifaq sub-bloc of Allawi. From this rough calculation, a somewhat more even distribution of resigned Iraqiyya MPs emerges. Parliament speaker Nujayfi still has the lion’s share of resigned MPs, but a considerable number of Hall deputies (Karbuli) – from Baghdad in particular – have also resigned. Pretty much all of the Iraqi Islamic Party has resigned, signifying their growing conflict with Maliki over the past few years. Politically speaking, it must be bad for Maliki that so much of the Karbuli faction has resigned. Back in 2012, following the conflict over Vice President Tareq al-Hashemi (who also resigned formally yesterday, at long last), there were signs they were ready to cooperate with Maliki. He didn’t really seem to respond, and today what remains of Iraqiyya in parliament are largely people close to Ayyad Allawi, who are even less likely to cooperate with him. That said, the question of the consequences of these resignations need not be as dramatic as one would first think. It is noteworthy that the question of resignation of MPs is governed by the law on deputy replacement from 2007, rather than by parliament bylaws. That law says parliament must approve the resignation of deputies if they resign of their own free will. To some extent, this may all be a pre-election stunt by deputies who realized they might lose their seats unless they improved their popular image. Still, the Iraqi parliament has to pass the 2014 budget before the April elections. It may still be able to get the quorum to do so without the resigned 44, though Maliki will now be more reliant on cooperation with the Kurds than before. It is also possible that some Sunni MPs will chose to remain active in parliament even in the polarized political climate of the day. On the pattern of the governorate council in Anbar – whose members continue to work with Maliki against movements they see as too extreme – they may realize that there are still Sunni Iraqis who are not particularly attracted to the radical rhetoric emerging from all sorts of pan-Islamic movements in neighbouring Syria. I have long maintained that Western commentary on the Middle East is driven as much by trends in journalese as by realities on the ground and historical facts. For example, for much of the past decade we have been told that the country of Iraq is about to “implode”, given that it was “cobbled together” after the First World War from three “disparate” provinces whose centrifugal forces have continued to “fuel” and “stoke” conflict between “embattled” Iraqi “factions” in the period after 2003, making it quite impossible for them to justly “divvy up” the country’s revenue derived from the “oil-rich Shiite south” and the “Kurdish north”. All of this is misleading, and if these clichés hadn’t been employed by Western journos and pundits in the first place it would perhaps have been easier to understand the survival of Iraq as a nation despite pressures from the outside that can hardly be described as other than extreme. With the recent shift of attention to Syria, a new artificial focus of discussion has emerged among Western pundits, namely, whether the Sykes-Picot agreement between the British and the French during the First World War is in the process of “unravelling”. Most commentators seem to think it is, with a particular emphasis on the supposed role of Sykes-Picot in determining the modern boundary between Iraq and Syria. As a consequence of this perspective, the ragtag of bandits and terrorists that is also known as the Islamic State of Iraq and al-Sham (ISIS) end up being portrayed, explicitly or implicitly, as the implementers of some kind of deep-rooted popular urge for pan-Arab and pan-Islamic unity that supposedly pulls the Syrian and Iraqi peoples towards each other. Here is why the current focus on Sykes Picot is misguided. 1. The Sykes-Picot Agreement Is Not What Many People Think It Is. When it was concluded in 1916, the main idea behind the agreement was to secure annexation of certain coastal areas that were deemed to be of particular interest to the allies, especially Basra for the British and the coastland between Lebanon and Cilicia for the French (the Russians were accorded control of the Straits for similar reasons). The truly important aspect of the Sykes-Picot map were therefore the areas of exclusive control along the coasts – British in Acre/Haifa and Basra (naval interest playing a key role); French in Lebanon and north to Alexandretta in Turkey (the location of Christian minorities was accorded much importance). By way of contrast, the details of demarcation in the interior – where a more informal form of British and French influence was envisaged – was accorded less importance at the time. Furthermore, scholars such as Eliezer Tauber and Nelida Fuccaro have convincingly demonstrated that local politics, not the rough lines of Sykes Picot, governed the final details regarding the disposal of border areas between Syria and Iraq like Abu Kamal and Jabal Sinjar during the 1920s. Conversely, local resistance against Sykes Picot at the time was mainly framed as a protest against the way in which the agreement divided what was perceived as “historical Syria” by isolating the coastal fringe including Lebanon and the Alawite lands from Damascus. The desire for union between Iraq and Syria, by way of contrast, was not such a central theme. By December 1918, the Covenant society loyal to the Hashemite princes, probably the most pan-Arab force of the day, had itself fragmented into Syrian and Iraqi branches, quite without the help of foreign officers. To the extent that cross-border irredentism continued to survive in the 1920s and the 1930s, it mostly had the character of local regionalisms rather than popular movements for Syrian-Iraqi unity. In particular, the territory along the Euphrates from Ana in Iraq north to Raqqa in Syria remained the subject of some turbulence, with Raqqa often enumerated among Iraqi nationalists as a maximum objective of western expansion. Similarly, Hanna Batatu identified a degree of interwar regionalism linking Mosul in Iraq and Aleppo in Syria as a result of the way new borders cut across that old trade region. At no point, though, did any viable separatist or irredentist party emerge. 2. 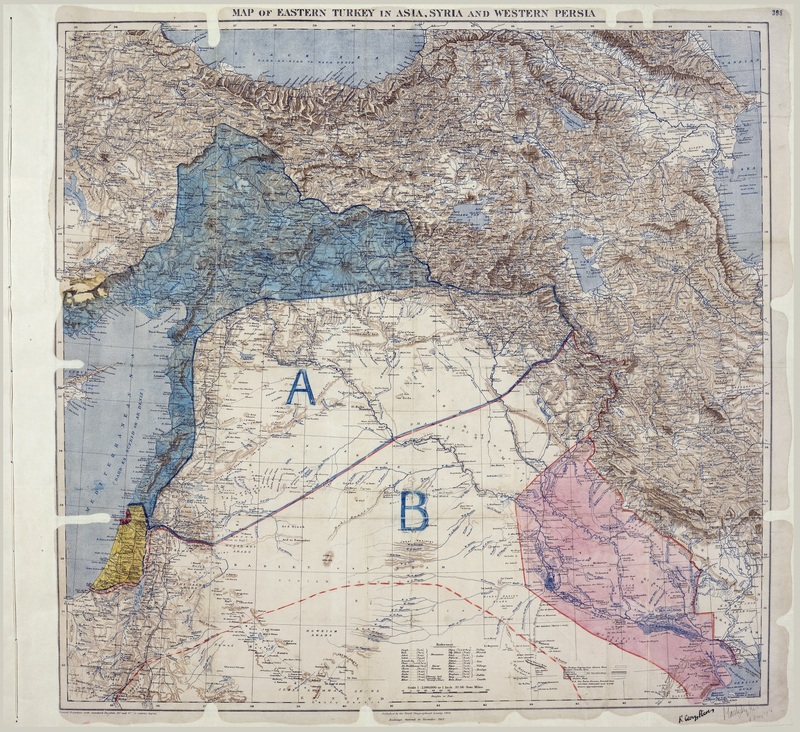 The Central Features of the Post-1918 Map of the Middle East Had Local Antecedents. Sometimes Sykes-Picot is being construed as a complete armchair project by willful European strategists. What is often not realized is the extent to which the agreement merely put on the map patterns of special administrative arrangements that had been in the making under the Ottomans for decades, if not longer. Thus, special Ottoman arrangements for Palestine and Lebanon date back to the nineteenth century: the special administrative district of Lebanon dating to 1861 and the special district of Jerusalem established in the 1870s. As for Iraq, it had been separated entirely from Syria in administrative terms almost since the beginning of Islam – and had for long periods been ruled from Baghdad as a single charge. Again, the only real exception pertains to the Raqqa-Ana borderlands which in brief intervals had gravitated towards Baghdad rather than Damascus. All the talk that these boundaries are a mere hundred years old and that everything was designed by a couple of European colonial strategists is utter unscientific nonsense that collapses immediately upon confrontation with contemporary primary documents, where terms like “Syria” and “Iraq” were in widespread use long before Sykes and Picot even knew where these areas were located. 3. The Bits of Sykes-Picot That Were Actually Implemented Are Very Few. It is often forgotten that most of the Sykes-Picot agreement was never implemented. Stipulated French control in Mosul was soon reversed. Alexandretta (Hatay)reverted to Turkey whereas the Alawite lands of Syria fell to Damascus during the decades of the French mandate before World War II. Sykes-Picot, by way of contrast, had prescribed territorial unity between what was seen as the “minority lands” of Lebanon, the Alawite areas of Syria and the mixed areas of southeastern parts of Turkey. What remains is the rough line of division between Syria and Iraq, but again that broadly reflected indigenous patterns of administrative subdivision and was not really implemented to the letter in any case. 4. Things Aren’t Unravelling Completely Anyway. OK, so we have hordes of ultra-radical Islamists occupying points on either side of the Syrian-Iraqi border. They talk pan-Islamic and sometimes act pan-Islamic. Isn’t that decisive proof that the borders of the past, whatever their exact historical origins, are falling apart? Far from it. They are receiving more attention today because everyone’s eyes are on Syria, but back in 2005 pan-Islamic movements also operated in this area, including an Islamic emirate in al-Qaim near the Syrian-Iraqi border. In the face of that challenge, the Sunni population of western Iraq rose in protest through the sahwa movements. Today, there is once more a tug-of-war between pan-Islamism and Iraqi nationalism, but by no means has the local population universally sided with the Islamist rebels. Despite continuing squabbles among Iraqi leaders, a considerable segment of local Anbar politicians have rushed to support the Iraqi army in its efforts against pan-Islamist elements, showing that the people of western Iraq are once more sceptical about getting too intimately connected with political movements aiming at union with Syria. As for the continuing confrontations between Iraqi PM Maliki and individual Sunni leaders in Anbar, there are two ways of looking at them: True, Maliki’s rather overt use of the Iraqi judiciary to selectively target political enemies comes across as tendentious and often reckless; yet at the same time the apparently bottomless supply of Sunni tribal leaders prepared to continue to do business with him testifies to a degree of popular aversion to the alternative of all-out revolution. Finally, note also that even ISIS in all their pan-Islamism couldn’t resist the differentiation between Syria and Iraq when they named their organization! The territorial spread of ISIS itself in Iraq and Syria with a core area along the upper Euphrates around Raqqa could even indicate that it resonates most strongly with a more limited historical legacy of regionalism in what was historically the Jazira borderland between Syria and Iraq (rather than with grand schemes for Fertile Crescent union) – and that this regionalism, in itself, ultimately remains subordinated to century-long patterns of administrative differentiation between Syria and Iraq that Sykes-Picot merely served to confirm. Nothing in this should of course be seen to deny the validity of stories emphasizing the bitter fate of individual families living in borderlands affected by Sykes-Picot. But borderlands are always different, and European towns and farms with similarly heartbreaking stories about borders tearing families apart are legion. That does not mean Europeans need to urgently revisit past territorial agreements arrived at in places like Versailles (1919) or even Vienna (1815). In sum, the current fixation with Sykes-Picot is just another case of Westerners being misrepresented as the omnipotent force in the Middle East. Today, the thing that appears to be in the greatest danger of unravelling is our fragile historical knowledge of the Middle East. After having mulled the question of a constitutional draft since at least June 2013, leading Syrian Kurdish politicians have recently published their draft constitution for areas they would like to see unified as a Kurdish region in a future Syrian federation. In analyzing the Syrian Kurdish draft constitution, two logical points of comparison stand out: The draft constitution of the Iraqi Kurdistan region dating back to 2009, as well as the Iraqi constitution of 2005 which was drafted with heavy Kurdish influences. Generally speaking the Syrian Kurdish documents seems closely modelled on the Iraqi Kurdistan precedent, though with some important exceptions. Comparisons with the Iraqi constitution of 2005 are less rewarding simply because the Syrian Kurds have largely refrained from demarcating the exact borderline between federal and regional power in their draft constitution. The Syrian Kurdish draft constitution begins with a section on fundamental concepts. Among other things, the northern Syrian city of Qamishli (Qamishlo in Kurdish) is designated as the capital of the proposed region. The Persian new year (Nowroz) will be the national holiday, and there will be a flag for the region, although its design is not defined by the draft paper. Kurdish and Arabic will be the official languages of the proposed region. The draft specifically states that the Kurdish people have chosen union with the rest of Syria in a federation and envisages the event of the termination of the relationship (i.e. secession) in the event that the federal authorities act unconstitutionally or in a racist manner. The second section of the draft constitution, exactly like the Iraqi Kurdish one, is a long list of rights. In many ways the document goes further than many Western constitutions in terms of explicitly guaranteeing civil liberties, the rule of law, the impermissibility of all forms of torture or extra-judicial punishment etc. Whereas much of the second section could be seen as boilerplate, the hard aspects of constitution writing are contained in section 3 on the structure of government. Unsurprisingly, a republican model of government has been chosen. Parliament will consist of one representative for every 35,000 inhabitants, and a degree of proportional representation of ethno-religious minorities (mukawanat) seems implied. Parliamentary cycles will be of four years’duration. The envisaged Syrian Kurdistan parliament will legislate in areas of government that are not the exclusive prerogative of the central government; these areas are however not enumerated. It is still possible, though, to catch a glimpse of the intensions of the Kurdish constitution framers in this respect insofar as certain areas of government are accorded special mention. Firstly, it is stipulated that parliament will legislate taxes and adopt an annual budget, meaning considerable financial autonomy is envisaged. Secondly, parliament will appoint heads of “regional guards”, the police and security forces. The nomenclature is identical to Iraqi Kurdistan, which governs its security affairs entirely without any interference from Baghdad. As regards the proposed executive, the vision of presidential power is particularly interesting. The Syrian Kurdish constitution calls for a strong, popularly elected president that will have significant roles with respect to government formation, relations with federal authorities, amnesty, and questions regarding state of emergency. The Syrian Kurdish president will however not be quite as strong as his Iraqi Kurdish counterpart. Whereas the Iraqi Kurdistan president is commander in chief of the Kurdish armed forces, the Syrian Kurdistan one will be so for ceremonial purposes only. Similarly, whereas the Iraqi Kurdistani president has the right to initiate legislation, no such role is foreshadowed for the Syrian Kurdistan president under the draft constitution. Presidential terms are limited to two times four years, similar to all other leading positions in the proposed arrangements. Regarding the powers of the cabinet, a particularly interesting point relates to oil and gas. It is stipulated that the cabinet will cooperate with the central government in order to find the best way of exploiting oil and gas resources, with Syrian Kurdish parliamentary approval needed for anything relating to resources within the Kurdish region. Compared with the situation on the ground in Iraq – where Kurdish authorities have recently concluded entire pipeline deals with Turkey without much discussion with Baghdad – this does come across as a somewhat softer position, allowing a greater role for Damascus in Syrian Kurdish energy discussion than what the KRG is prepared to accord Baghdad. Finally, the chapter on state structure envisages the creation of a fully-fledged judiciary, with its own prosecutor-general, court of cassation and even a constitutional court. Again, this resembles Iraqi Kurdistan realities to some extent and arguably goes even further in terms of carving out regional autonomy. A separate chapter deals with security. Some of it consists of reiteration of points already mentioned under the powers of the executive and the legislature. Other articles add interesting pieces of information. For example, it is stipulated that the minister of the interior should be a civilian. Also, the point is made that the guards of the region, although locally controlled, should be financed by the central government for the role they ostensibly play in external defence. This, in turn, relates to the Iraqi precedent, where the Kurds demand that Baghdad pay for their peshmerga forces. The big difference with respect to the Iraqi precedent concerns constitution making at the federal level. Already in the 1990s, Iraqi Kurds began writing constitutional draft for a future Iraqi federation of Arabs and Kurds. That document, in turn, made it easier to see what the Kurds envisaged in terms of distribution of power between the centre and the region in various spheres of government. Such a proposal at the federal level is still lacking with respect to the Syrian Kurds. The only mention of an exclusive power of the federal government is an en passant reference to foreign policy. This makes it more difficult to discern the maximum demands of the Syrian Kurds in their new draft constitution – perhaps a reflection of a situation that is even more chaotic than post-Saddam Iraq, as regards the external environment and intra-Kurdish divisions alike. It was apparently shot down by major Yemeni parties shortly after its release, but the new official UN policy document on Yemen and the problem of southern separatism is worth a closer look for what it says about the spread of federalism in the Middle East more generally, and the enduring influences of Iraq’s ambivalent federalism experience in particular. Two key questions will recur in any proposal of constitutional federal design. Firstly, there is the issue of distribution of power between the centre and the regions. Secondly, there is the question of demarcation of regions in the new federal state. The UN proposal for Yemen, authored by the UNSG special representative Jamal Benomar, is particularly interesting for the details it provides on the UN suggestion for the second question, i.e. what will be the constituent elements of a new federal Yemeni state. Whereas the question of what responsibilities will be vested in different levels of government is largely left unresolved (and considered as being within the domain of new constitution writing), the UN paper does provide a high level of detail on what sort of political process could determine the fundamental administrative structure of a new Yemen. The proposed mechanisms for sorting out Yemen’s future administrative structure are set out in section 3 of the UN paper. In the first instance, the UN envisages the formation of a national committee that will deliberate the question of what will form the ideal federal regions in Yemen, based on a series of key indicators ranging from historical factors to infrastructural considerations. The committee will specifically consider previous proposals ranging from a federal state of two constituent elements (north and south) to multi-regional proposals (typically ranging from 5 to 7 federal regions). Existing governorates (muhafaza, same term as in Iraq) will become “provinces” (wilaya) in the event of joining a new region (iqlim, also same terminology as Iraq). The more problematic aspects of the paper relate to the very realistic prospects that, a) the committee fails to agree internally, and b) the population of the affected areas don’t agree with the proposals of the national committee. Firstly, absent intra-committee consensus, provisions are made for a ¾ secret majority vote inside the committee itself. Failing that, the head of the committee is given special powers to seek consensus, albeit the mechanisms for doing so remain largely unclear. The question of what will happen if there is not even an absolute majority for anything on the committee is left completely untouched. At any rate, the rest of the document is predicated on a scenario in which a definitive proposal of federalization into a finite number of regions does indeed emerge from the committee. It then goes on to consider the modalities for popular approval. Or, rather one should say “local politician approval”, because everything will apparently be settled by votes in the councils of the existing governorates rather than by popular referenda. In the first instance, a two-thirds majority of the provincial council members in a governorate affected by a proposed new region can reject incorporation in that region. The Yes governorates, in turn, may elect to form a region of their own without the No governorates if they can muster the required majorities for the modified regional vision. The No governorates are also accorded a second chance to join the proposed region through a second vote within 3 months; however it they then fail to join, they will remain governed by the central government for at least five years. (Apparently, they will not enjoy the option of transforming themselves to a single-governorate federal region.) Later, after five years, they can form a region together with other such non-federated governorates based on a 60% majority of their councils or they can join an existing region that may be willing to let them enter. Finally, the UN document envisages the possibility of super-region formation on the basis of neighbouring, newly constituted federal regions, requiring a ¾ majority approval in the provincial units (wilayas) of the new regions. Does this sound familiar? In many ways the proposed process borrows from the experiences of federalization in Spain in the late 1970s after the transition from decades of authoritarian rule under General Franco, which also played out as a dialectic between popular initiatives and elite demarcation of the new federalism map. Importantly, in the way the Yemen proposal is heavily biased towards the signals from the national committee it largely resonates with what actually happened in Spain. Whereas the new Spanish constitution outlined an interesting model of ultra-democratic bottom–up federalization, elite politicians soon got worried about the forces let loose by this process and largely recouped leadership of the process, eventually settling the federal map of Spain largely through committee fiat. Crucially, in the UN paper on Yemen, whereas in theory everything is approved at the level of existing governorates, in practice the initiative rests firmly with the national committee. If they fail to join a region defined by elite politicians, governorates will be saddled with central government administration for five years, almost as if it is meant to constitute punishment for failure to adhere to the new federalism imposed from above. It can be useful also to contrast the proposed mechanisms with the way federalism has been tentatively implemented in Iraq after 2005. Generally speaking, it seems the UN is eager to avoid some of the weaknesses that emerged from the very permissive model for federalization that was eventually adopted in Iraq through the law on forming federal regions in October 2006. In the case of Iraq, there is the theoretical possibility of almost endless and continuous region formation, something that can easily prompt political instability and may lead to situations in which the threat of region formation can be used for all sorts of blackmail purposes even by politicians who are entirely uninterested in the idea of federalism as such. This has posed significant challenges for the Iraqi central government, whose failure to allow several federalism initiatives in provinces like Basra, Salahaddin and Wasit can hardly be described as anything other than unconstitutional. Many will argue, though, that the government’s actions are justifiable for the sake of the stability of the country, and that it is really the constitution and the federalism law of 2006 that go too far and that need reform. Conversely, in Yemen, such scenarios of bottom–up federalization will now be more unlikely. The more pressing question is how this latest UN paper will fit in with existing visions of federalism (and even independence) among the key political players, and with the process of national reconciliation more broadly. In the first place, it is unclear what role this kind of paper will really play given that it is predicated on a process of constitution writing which will likely in itself be an autonomous affair, to some extent unbound by past agreements. Second, there is the question of whether the vision of agreement on federal units among national political elites is a realistic prospect. At the present time, it is thought that the vision of a large number of federal units is partly a northern strategy to dilute the southern vision of a two-state entity that would eventually permit southern secession. For its part, the vision of southern unity seems to mask the existence of multiple, partly incompatible, projects of southern autonomy and even independence. In particular, the extent to which historical centres like Aden and the Hawramawt can realistically be considered a unified force seems open to question. Unlike the situation in Iraq in 2005, where Kurdistan was the only realistic candidate for immediate federal status, the Yemen situation is muddled by the existing of multiple aspirations to autonomy that are sometimes mutually incompatible. Perhaps the most interesting aspect of this paper is the light it casts on the UN role in navigating Yemen’s complex political landscape. Lip service is being paid to a democratic process of federalization, yet the paper gives a national committee of political elites the greatest say in the matter, with governorate politicians (rather than the inhabitants of the governorates) playing second fiddle. Realistically speaking, a paper like this can probably be nothing more than a means to help initiate a more fundamental process of constitution writing, during which unresolved issues will inevitably come up again. Yemen looks set to have a cumbersome federalization process – more like Libya than Iraq – but then again the Iraqi precedent makes it abundantly clear that decisions on momentous things like federalism are probably best made without deadlines and time pressures being imposed with force from the outside.